Welcome to the long Labor Day Weekend! I hope everyone gets to take a break from work to enjoy this final weekend of summer. The good news? Autumn is just around the corner and that means fall foliage, apples galore and warm fuzzy sweaters! This is our final post of August and we're wrapping up our regularly scheduled programming. :-) We sure hope you've enjoyed spending time with Paper Made Bakery and our Fresh Baked Kits. I've loved every minute -- and just wanted to tell you that. Another BIG thank you to our guest designers this month: Tenia Nelson, Niki Garcia, Melissa Shea and Jenn Shurkus. You ladies ROCK! We'll continue to offer our past Fresh Baked Kits until they're gone, so think about making one a special gift for a crafty friend or relative, or maybe you'd like to put a couple onto your own Christmas list! We can work out all the details of getting them shipped to just the right person (just about anywhere in the world!) 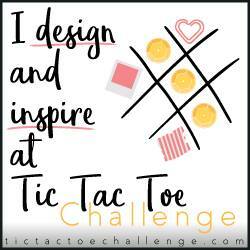 All of our design team samples, inspiration, and fun ideas will be right here so come on back and enjoy. 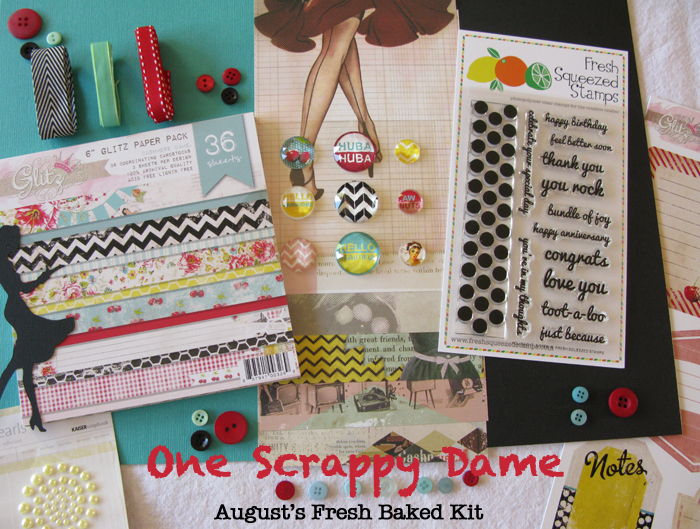 So, here's a little card I made with the One Scrappy Dame kit. I made the origami dress by watching this video and found it to be a fairly simple creation. I've several of these dresses and thought they'd be fun to use for a variety of occasions, depending on the color and patterned paper you chose. 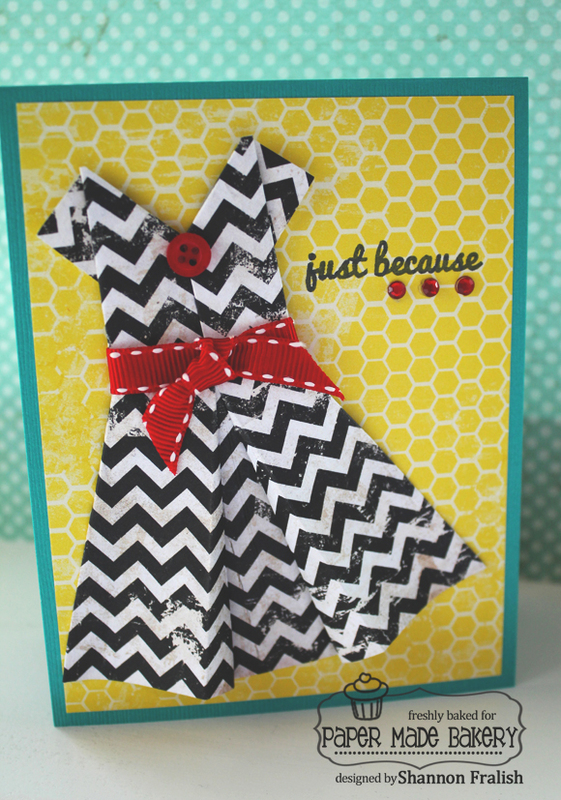 Here I've used the sassy black and white chevron patterned paper for the dress, some ribbon and a little button, then layered it all onto the bright yellow honeycomb card front. All of this, as well as the clear stamp set, is included in the kit! The tiny red rhinestones are from my stash. On the inside of the card I included a white insert layer and then used the fun polka dot border stamp from the You Said It, Sister set with pretty red ink to make a splash -- that's a great border stamp to jazz up any card! Wow! The dress is beautiful!!! gorgeous...love how the origami dress just pops! Thanks to the Paper Made Bakery for such fabulous inspiration! I'm really going to miss your kits Shannon but know that the decision you've made is awesome for you and Fresh Squeezed Stamps! Thank you, Amy! The future is bright and the sky's the limit! I so appreciate your sharing with us on our design team - your work is incredible and it really brought us lots of new PMB fans. All the best to you, too! Ohhhhhhhhhhhh I love love love this!! LOVING that dress!! WOW!!! Thanks for so much inspo from your teams and you Shannon!! I had a blast working with you!!!!!!! Cheers, Julie! It was so nice to have you on our team and to finally meet you at CHA. I hope our paths will continue to cross and I wish you and your awesome family all the best! Love that dress! Mahalo Shannon for this amazing opportunity and see ya over at Fresh Squeezed Stamps! oh that dress is too cute! such a great idea! thanks for having me this month and good luck with the FSS! This is so adorable!!! I love it.